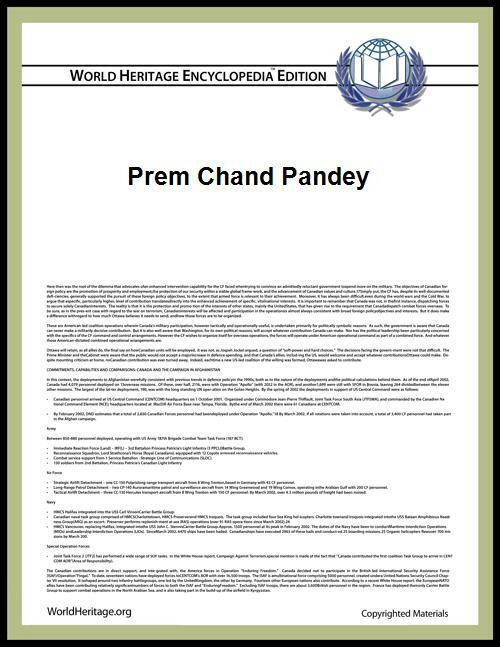 Prem Chand Pandey is an Indian scientist and academic in the fields of Satellite Oceanography, Remote Sensing, Atmospheric Science, Antarctic and Climate Change. Pandey obtained his Masters and Bachelors degrees in Electronics and science respectively from Allahabad University, Allahabad. He completed his D.Phil. degree from the same university (on microwaves) in 1972. In 1966, Pandey became a lecturer in DAV Degree college, Azamgarh. From 1968 to 1972 he was Council of Scientific and Industrial Research Research Fellow at the microwave research laboratory of the Department of Physics, University of Allahabad, and from 1973 to 1977 a research officer at the Central Water and Power Research Station, Khadakwasla. In 1977 he joined the Space Applications Centre(SAC)/ ISRO, Ahmedabad and became the founder head of the Oceanic Sciences Division/ Meteorology and Oceanography Group/ Remote Sensing Applications Area (OSD/ MOG/ RESA). He worked for the next twenty years at SAC. In the 1980s he was also a research associate at the NASA - Jet Propulsion Laboratory, Pasadena, where he worked on the Upper Atmosphere Research Satellite and SEASAT programs. During 1997-2005, he was the founding director of the National Centre for Antarctic and Ocean Research (NCAOR)/Ministry of Earth Sciences (MoES), Goa. At the initiative of Murali Manohar Joshi he founded the K. Banerjee Centre of Atmospheric and Ocean Studies (KBCAOS) to initiate the Atmospheric and Ocean Science Studies in Allahabad University which is now full fledged faculty academic centre of Allahabad University. He was Visiting Professor at Center for Ocean, River, Atmosphere and Land Sciences (CORAL), IIT Kharagpur (IIT-Kgp) since 2005 to 2007 and also he was an Emeritus Professor at IIT-Kgp's same center since 2007 to August, 2011, where he played key role in establishment of the CORAL. Currently he joined as a Professor at School of Earth, Ocean and Climate Sciences, IIT Bhubaneswar with effect from 1 September 2011. Fellow of the National Academy of Sciences, India, Indian Meteorological Society, Indian Academy of Sciences, Society of Earth Science India,Indian Geophysical Union,Indian Society of Remote Sensing, Dehradun (1999). Indian Society for Mathematical Modelling and Computer Simulation  and Geological Society of India, Bangalore. Certificate of Recognition and Cash Award-1985 by NASA. Felicitation by Shri Kapil Sibal, Honorable Minister for S/T and Ocean Development, for outstanding achievements in Polar Science & Ocean Science and Technology, on 27 July 2004, on DOD (MoES) foundation Day. An Honor of "Proud Past Alumni" in the list of 42 members, from "Allahabad University Alumni Association", NCR, Ghaziabad (Greater Noida) Chapter 2007-2008 registered under society act 1860 with registration no. 407/2000. Member, Governing Council, IITM, Pune. Member, Academic Council, Goa University (Governor’s Nominee). Member : (Visitor’s Nominee )Selection Committee for Earth Sciences in Pondicherry University (A Central University). Adjunct Professor at BITS (Goa Region) (up to 2007). Member, Research Advisory Committee of Center of Atmospheric Sciences (CAS) of IIT Delhi. Member, Science & Engineering Research Council (SERC), Department of Science and Technology, New Delhi. Scientist Member, Governing Council of IITM, Pune. Member, Programme Advisory Committee on DST on Atmospheric Science/ Glaciology. Member, NNRMS Oceanography, Programme of ISRO. Vice Chairman of OSTC Cell of DOD at Mangalore/ Tamil University. Member, High Power Ministerial delegation led by Hon Shri Kapil Sibal to Antarctica. Member, ICSU/WMO committee for International Polar Year (IPY) framework documents preparation. Chairman, High Power Committee set up by Ministry of Earth Sciences (MoES), GOI to Review NCAOR’S activities, 2008. President (sectional); Environmental Science Section, Indian Science Congress Association, 2006-7. Also remained member of Executive Council of the Indian Geophysical Union (1991–1993). Pandey has published more than 134 research papers, 7 books, 9 reports and 4 Atlases has guided 11 PhDs. He has also edited a number of journals like Marine Geodesy, Indian Journal of Polar Science, 2008 and the Remote Sensing section in Mausam, the quarterly research journal of India Meteorological Department. He has been a member of the editorial board of the Journal of the Indian Society of Remote Sensing Indian Journal of Radio & Space Physics (IJRSP), Indian Journal of Marine Science, India (1995–2000), Vayu Mandal, Bulletin of Indian Meteorological Society, (1995–1996), Proceedings of Indian Academics (Physical Sciences) and the Journal of Indian Society of Remote Sensing (2006). India in the Antarctic: Scientific and Geopolitical Perspectives, with Sanjay Chaturvedi, Neloy Khare, Centre for the Study of Geopolitics, National Centre for Antarctic and Ocean Research, India. 2005. ISBN 81-7003-287-3. Dharati Se Pare Antariksha Tak: Vigyan Ki Pahal, with Neloy Khare, National Centre for Antarctic and Ocean Research, India. 2001. Bharat Me Vigyan Ki Uplabdhiyan: Ek Jhalak, with Neloy Khare, National Centre for Antarctic and Ocean Research, India. 2002. Antarctic Geoscience, Ocean -Atmosphere interaction and Palaeoclimatology, with S. Rajan, National Centre for Antarctic and Ocean Research, India. 2005. Dharakata Mahadweep, with Neloy Khare and Rakesh Sharma, National Centre for Antarctic and Ocean Research, India. 1998. Pandey, P.C. (2007) in "India: Antarctic Program", Encyclopedia of the Antarctic edited by Beau Riffenburgh, pp. 529–530, Abingdon and New York: Taylor & Francis, ISBN 0-415-97024-5. ^ Faculty page, Indian Institute of Technology, Kharagpur. ^ a b " Pandey is Proud Past Alumni of Allahabad University". Pandey is told AU’s Product in Allahabad University Alumni Association web page. ^ "SAGAA 2011 Organizing Committee: P C Pandey is Chairman said to be founder of KBCAOS, Allahabad University". (PDF) National Conference on Science& Geopolitics of Arctic& Antarctic organized in chairmanship of Dr. P. C Pandey where it is stated that he is Founder of KBCAOS, AU. ^ " KBCAOS: Atmospheric and Ocean Science, Allahabad University (AU)". Allahabad University official web page. ^ "Prof. P C Pandey Joins IITBBS". (PDF) A doctorate in Physics (Microwaves) from Allahabad University, he is credited with the initiation of the satellite borne microwave remote sensing of Ocean Atmosphere and Cryosphere research in India. Professor Pandey was the Founder Director of National Centre for Antarctic and Ocean Research, Goa from 1997 to 2005. He has spent a major part of his career at Space Application Centre (ISRO), Ahmedabad, and has worked for about five years at the NASA’s world famous Jet Propulsion Laboratory, USA. Professor Pandey has carried out extensive research in the areas of satellite oceanography, atmospheric science, climate change and polar science................He was also a member of the delegation led by Hon’ble Kapil Sibal to Antarctic, the first ever ministerial delegation to visit Antarctica. Professor Pandey has represented India in various International symposia related to Polar Science and Logistics such as Scientific Committee on Antarctic Research (SCAR), Antarctic Treaty Consultative Meeting (ATCM) etc. Professor Pandey is the recipient of the prestigious Shanti Swarup Bhatnagar Award (1989), Professor Vikram Sarabhai Award and Gold Medal, Om Prakash Bhasin Award and Vigyan Gaurav Award of U.P. Council of Science and Technology as well as the NASA award:IIT Bhubaneswar web page says. ^ " Professor Pandey at present at School of Earth, Ocean and Climate Sciences, Indian Institute of Technology, Samantapuri, Bhubaneswar-751 013". According Indian Academy of Sciences Pandey is Faculty of IIT Bhubaneswar. ^ " Fellows", The National Academy of Sciences, India. Accessed 2010-08-18. ^ Earth Sciences: 1989 -Pandey, Prem Chand Council of Scientific and Industrial Research "Dr Pandey has made significant contributions to the development of the technique of microwave remote sensing from satellites for obtaining atmosphere and ocean surface parameters. His concept of combining microwaves with infrared derive cloud parameters has been widely acclaimed." ^ Scientific Awards: Dr. P.C. Pande- Director, National Centre For Antarctica and Ocean Research Council of Science and Technology, Uttar Pradesh. ^ Advances in Marine and Antarctic Science. New Delhi: A.P.H. Publ. Corp. 2002, p. 449 (ISBN 81-7648-347-8). ^ "SHRI OM PRAKASH BHASIN AWARDS in ENGINEERING Including ENERGY and AERO SPACE". Award Presented by Dr. A. P. J. Abdul Kalam, President of India for 2004-2005 on 26 October 2006. ^ "according LIFE SKETCHES OF GENERAL PRESIDENT AND SECTIONAL PRESIDENTS 94th INDIAN SCIENCE CONGRESS, ANNAMALAI NAGAR, 2006-20 Dr. Pandey was awarded by Hari Om Ashram Perit Dr. Vikram Sarabhai Award and Gold medal in the field of Atmospheric Sciences and Hydrology, in 1987 (first recipient in ISRO)". (PDF) EVERYMAN’S SCIENCE Vol. XLI No. 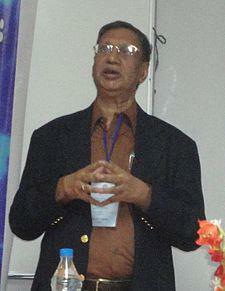 4 (October ’06 – November ’06) Dr. P C Pandey was President of Section of Environmental Sciences. ^ "According Indian Academy fellow page Prof. Pandey is D.Sc. (h.c.)". Prof Pandey honoured D.Sc. (h.c.) from V B. S. Purvanchal University, Jaunpur. ^ "MoES-NERC Workshop on The Changing Water Cycle-MOES Biographies". (PDF) Prof Pandey is recipient of the Khosla Award. ^ "The Rekha Nandi and Bhupesh Nandi Award-The Institute of Engineering (India), Kolkata". Dr. Pandey is recipient of The Rekha Nandi and Bhupesh Nandi Prize from the Institution of Engineers (India) during Prize Distribution ceremony of the 25th Indian Engineering Congress, Kochi, 17 December 2010. ^ "MoES-NERC Workshop on The Changing Water Cycle-MOES Biographies". (PDF) Prof Pandey is recipient of the Felicitation from the minister of the Govt. of India. ^ " Internet Archive of Proud Past Alumni"
^ "" Internet Archive of Proud Past Alumni"
^ Subject Editors - Mausam India Meteorological Department. ^ Editorial board: Journal of the Indian Society of Remote Sensing springer.com, Earth Sciences. "CSIR-Prize Winner Index" (Alphabetical). Prem Chand Pandey-1989.